David Trull - Beautiful World. Background bio - Back in his high school days, with one faithful roadie and one faithful Fender amp in tow, David Trull was a regular feature at the Roadhouse in Webster Groves, MO. Every Tuesday, the Roadhouse Bar and Grill would have local blues hero Alvin Jett onstage to lead a jam session. David headed to the Roadhouse, rain or shine, for three years’ worth of Tuesdays. On that stage, David struck his musical roots in the soil of the blues. His great loves at that time were The Allman Brothers and The Derek Trucks Band; he was known to laugh in rapture at the grinding, throaty “breathing” of Derek Trucks’ guitar. Years later, at college, David found a different kind of treasure: he discovered The Milk Carton Kids. Their blend of eclectic, punchy song‐writing and limpid melodies inspired him to write music more restrained, music more focused on lyrical power. He began by covering several of his favourites at an open mic night in the spring of 2013, where his rendition of “Michigan” was received with a standing‐o. Along with two friends, David formed a musical trio called Bourbon & Bitters. (By all accounts, he was the ‘bitters’ in the relationship.) 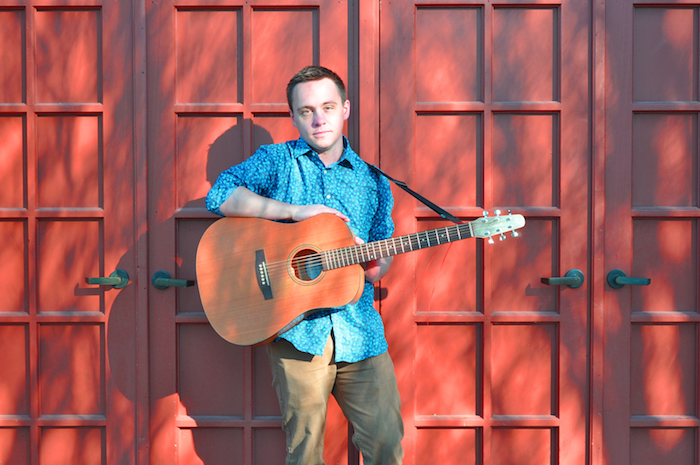 This act was the vehicle for him to try his hand at song‐writing, and he wrote and performed over a dozen songs over the remainder of the semester, touring through Southern California in support of these new compositions. 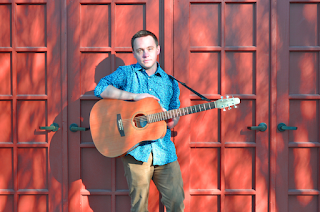 Upon graduation, he scraped up enough cash between graduation gifts and tips from local gigs and recorded his debut EP Sowing Season, which later became a popular add at CMJ stations. Those songs are about beginnings, David says, which seemed like a proper theme for his first effort. David, now home in his native St. Louis, is no longer at the beginning of things. He has completed his first full length album, Coin Toss inspired by and composed during his hiking of the Camino de Santiago, an ancient pilgrimage route across France and Spain. He’s tasted some of life, and it’s a broad world, with many beautiful things in it; but at the same time, much is fragile and out of reach. The sweet certainties of childhood, which are so celebrated in Sowing Season, are harder to hold onto the further you go into the world we’ve inherited. The pain of losing those footholds will be on full display in his new album‐ but that shouldn’t surprise any of David’s devoted listeners. For a man with his feet in the blues, writing about loss, heartache, and the humour of it all is nothing less than second nature. The full length album 'Coin Toss' (out June 3) is a pleasing collection of songs, of which the featured track 'Beautiful World' is pretty representative. With a predominately acoustic feel, if you like something a little more gentle and laid back, the quality of song writing and performance, makes this an attractive option. Daniel Trakell - Wasted Light. 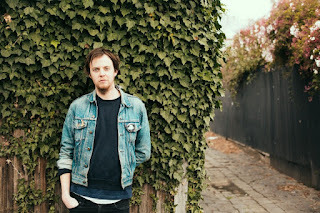 Background promo - Daniel Trakell has spent the better part of the last decade writing and recording several albums and touring Australia and the world with Melbourne groups Fire Underground and Dancing Heals. As both bands came to an end, finding himself with an ever-growing collection of home demos and no outlet, Trakell went in to Abbotsford studio The Aviary to record his debut solo record with friend and talented producer/Gotye percussionist Joshua Barber. 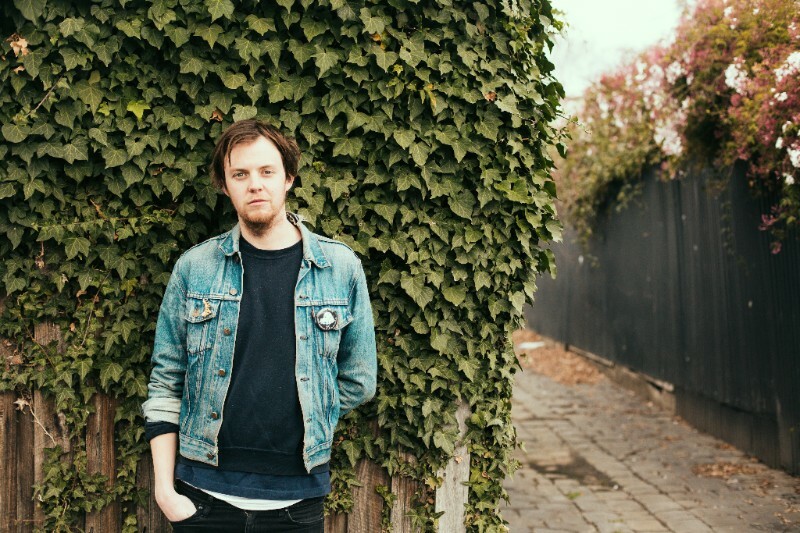 Daniel was recently announced as one of six winners of Triple J Unearthed's 2016 NIDA competition, selected to have a music video for another track from the EP produced by NIDA's finest filmmaking students. 'Wasted Light' really does have a Beatles musical feel to it. Vocals are delicate and refreshing whilst the background music gradually builds into something quite special. The production is very good, as is the song. Dear Thieves - My Street. Background promo - Dear Thieves are a hard hitting alternative indie two piece, hailing from Melbourne, Victoria. 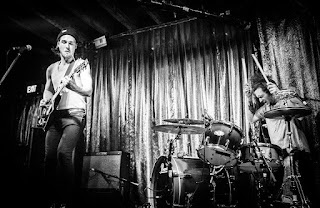 The band consists of Joel Hansen and Jesse Jones, who down sized from a four piece indie rock band in Brisbane, to take their business south of the Queensland border in 2013. Since then they have been prolifically fine tuning the two piece sound, to bring a unique and melodic change to the two piece outfit. Their last self-titled EP, released in 2014 was described as “glistening indie rock, with a charged romanticism” and set the tone for their upcoming single “My Street”. The new single was recorded at Melbourne’s very own Head Gap Studios, and at the helm was head engineer, Neil Thompson. The song itself is about big nights and there big repercussions, drawn from artist experience. With their high energy live shows, which leave no muscle dormant and no stone unturned, the boys are ready to take Dear Thieves to bigger, and much louder pastures. 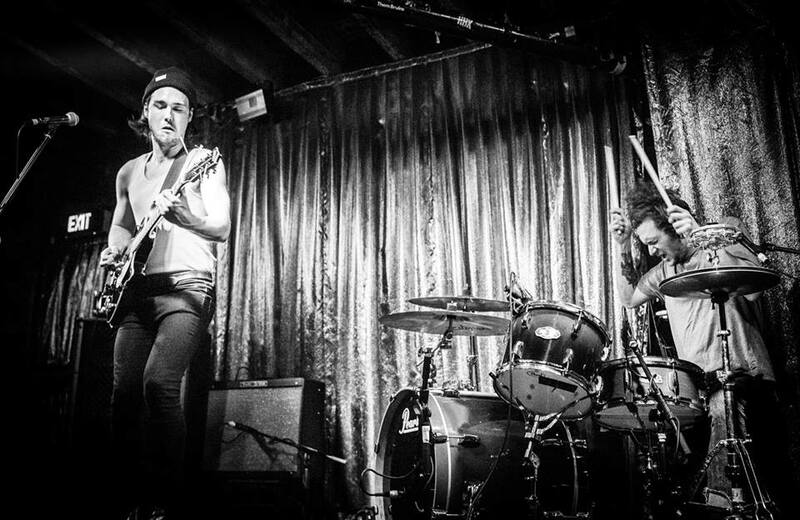 Dear Thieves crank the music up with 'My Street' a blistering rock'n'roll piece. With the powerful sound that rock duo's can create, the pair deliver a well crafted song that strikes a good balance between noise and detail. 'My Street will be released 20th of May 2016. Broadway Sounds - Exclusive Love / Digital Influence. Background promo With an impressive following in their native Australia, afro-infused electro-funk pioneers Broadway Sounds will finally be bringing their effervescent retro fun to the rest of the world, with an EP release scheduled ahead of some UK festival appearances this summer. The "Exclusive Love/Digital Influence" EP release will drop on 20th May via 100 Billion Wires and features the brand new title track. Today the band are thrilled to share the new video for the track, alongside the news that they will be playing Glastonbury Festival on Saturday 25th June. Meeting at the intersection of afro rock, boogie funk, township jive, afro funk, kwela jazz, soca, RnB, folk and soul, Broadway Sounds are a new breed of psych-pop that push the boundaries and make it work. 100 Billion Wires is a new London based independent label project set up as a labour of love by 3 friends to support exciting new left field music from the grass roots. Drawing on their collective experience of working in labels, live and music publishing, across acts ranging from Young Fathers, ho99o9, Lee 'Scratch' Perry, Peanut Butter Wolf to The Fall, Shabazz Palaces, Metronomy & The Streets - eclectic tastes are reflected in the label's approach to releasing new music from emerging artists. 'Exclusive Love / Digital Influence' is a mixture of classic funky sounds with a more modern electro twist and even the odd Kraftwerk moment. It's fun and ticks a whole lot of boxes for me. Hunter As a Horse - Fallen Leaves. 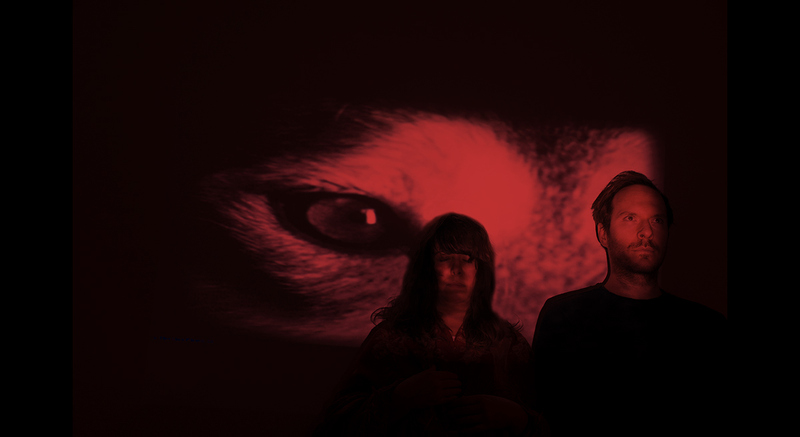 Background promo - A haunting, psychedelic synth-infused journey filled with stories of wolves, spirits and a first kiss shared in the woods, "The Two Magics”, is a powerful debut EP from Hunter As a Horse. The sound is distinctly their own - a surprisingly comfortable blend of folk, disco and pop with dark cinematic leanings. Co-produced by Ewan Pearson, the release is the result of a year-long self-imposed exile from London to rural Italy. The band, Paul Gala on synths and machines and Mia van Wyk on vocals and guitar, moved south to “channel the gods of dark cinematic Italo disco” where they built a studio in an old farmhouse in Tuscany, previously owned by the local sorcerer “il terzo occhio” (he who has the third eye), and began writing and honing their sound in earnest. 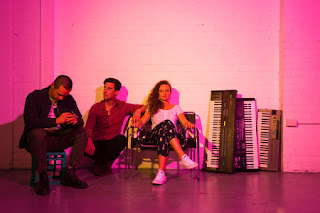 The band cite influences as diverse as Nina Simone, Jimi Hendrix, Lali Puna and Johnny Cash, “anything arpeggiated” and of course are heavily influenced by Italo and the sounds of the 80s. I am so, so impressed by the debut EP 'The Two Magics'. Featured song 'Fallen Leaves' is one of five mini masterpieces, as Hunter As A Horse develop intensely beautiful music.